Residents of Rio de Janeiro—cariocas—are enjoying new transport options that connect them to employment, education, and leisure opportunities. Pictured here, three women take the city’s TransOeste BRT to go to school. Photo by Benoit Colin/WRI. Known for its beautiful natural landscapes, Christ the Redeemer statue, and Copacabana beach, Rio de Janeiro is an iconic city. Citizens’ ability to access these and local opportunities, though, has been limited in the past due to increased reliance on individual cars generating congestion. Low-income communities lack access to reliable, affordable public transit. Commuters face atrociously long travel times due to intense traffic congestion exacerbated by the geography of the city. One study showed that congestion cost Rio and São Paulo $43 billion in 2013 alone. But Rio’s transport system may be starting to switch gears. Over the past few years, city leaders have started pursuing low-carbon public solutions for urban mobility. And now, in celebration of its 450th anniversary this year and as the host city of the 2014 FIFA World Cup and of the 2016 Summer Olympic Games, the city is following up with concrete actions to begin transforming the city’s image into one of a global leader in sustainable mobility. 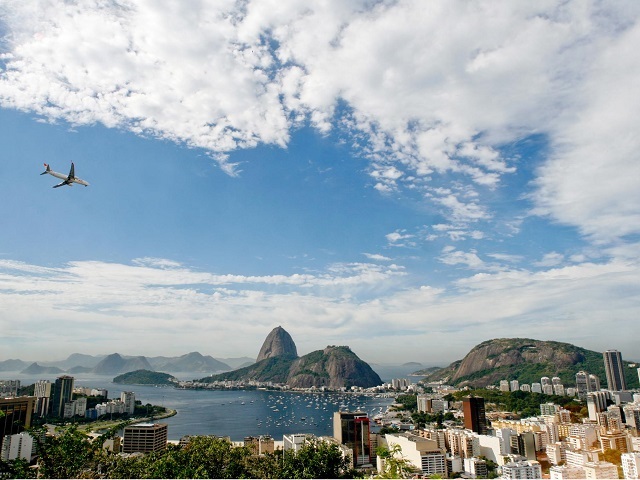 Let’s take a look at a few of the ways in which Rio and Mayor Eduardo Paes, also chair of the C40 Cities Climate Leadership Alliance, are building sustainable urban solutions that can inspire. Rio built its integrated control center in 2010, which allows more than 30 city agencies to monitor what’s happening across Rio in real time. In the past four years, the control center has reduced emergency response time by 30 percent. The impressive capabilities of the control center come from both the technologies involved—30 kilometers of optic fiber connect 560 cameras around the city, and 100 rainfall gauges operate 24/7—and the advantages of centralization. Additionally, approximately 8,800 buses and municipal vehicles are monitored via GPS to help monitor traffic and provide rapid response to traffic incidents. The control center allows the city to respond more effectively to natural hazards, accidents and other events in order to keep citizens safe. “The biggest benefits are the bad things that don’t happen, that won’t come to reality because of it,” said Mayor Paes in an interview with CNN. Rio’s network of high-quality bus rapid transit (BRT) serves 9 million people and saves 7.7 million hours of travel every month. Each bus on the two corridors already in place—TransOeste (56 km) and TransCarioca (39 km)—replaces 126 cars on average, resulting in a 38 percent reduction in carbon dioxide emissions on those corridors. 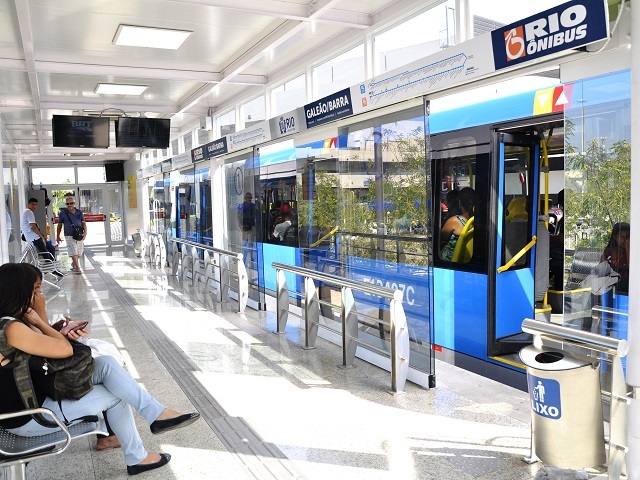 The city aspires to make its BRT system the best in Brazil by 2018, and will launch the new TransOlimpica corridor in 2016 to support key locations for the Olympics and provide connectivity to the existing corridors. A station on the TransCarioca corridor in Rio. Photo by Mariana Gil/EMBARQ Brasil. 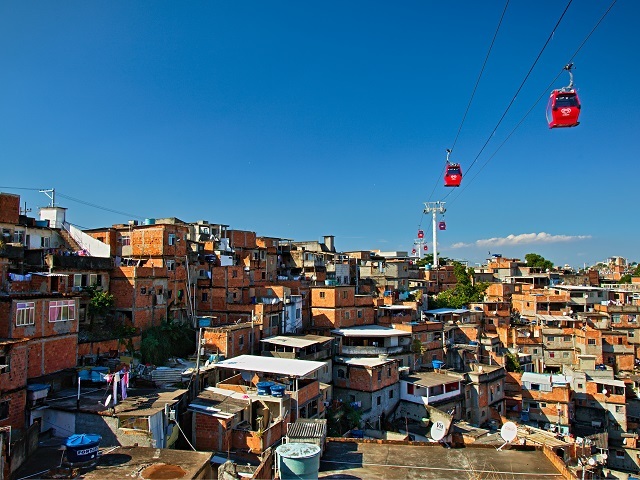 Rio’s hilly low-income communities used to be only accessible by foot and informal transport. In an effort to make these communities more connected and accessible, the city built the Teleférico do Alemão in 2011, the first mass transport cable car of its kind in Brazil. Each resident is entitled to a free roundtrip pass per day. The network spans 3.2 kilometers, with 152 cable cars that can transport ten people each. A single trip takes only 16 minutes to connect riders to Rio’s commuter rail network, greatly expanding residents’ access to jobs, healthcare and other social resources in the region. A free cable car system for residents ensures access to jobs, education, and other services in the city. Photo by Clément Jacquard / Flickr. 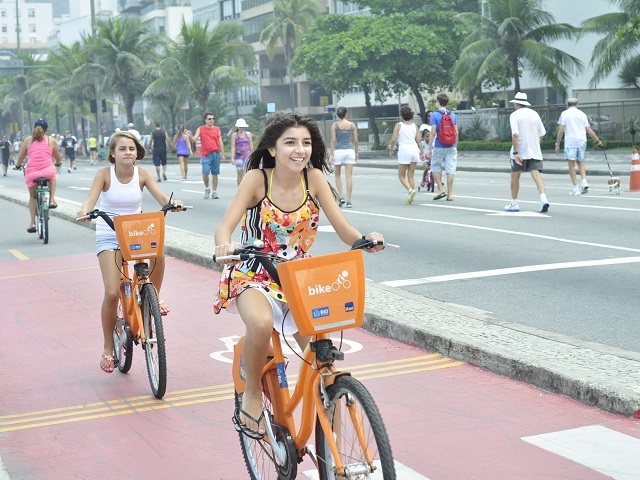 As a part of its strategy to reduce greenhouse gas emissions, Rio has announced its “Rio Biking Capital” (Rio Capital da Bicicleta) program, an initiative to develop 300 km of cycling infrastructure by 2016. The investment includes bikeways, bike paths, shared streetspace with cars and pedestrians, and bike parking infrastructure. Between 2009 and 2012, the city already created 152 km of new cycling pathways along the beachfront, and connected the city’s lake to the bustling Botafogo neighborhood. Future phases of the plan will improve connectivity to both existing and future BRT and metro corridors in several neighborhoods—not just beachfront areas that rely on bike infrastructure for tourism. In 2015, the city will increase its bike share program from 60 to 260 stations, adding 2,600 new bikes. While this system remains smaller than those in leading bike share cities like Paris, London, or New York, Rio’s is the second largest in Latin America. Transport challenges still exist, but a cycling network and bike share systems are expanding in the state capital. Photo by Mariana Gil / EMBARQ Brazil. While the city will likely continue to face significant infrastructural and social challenges for years to come, it’s encouraging to see Rio’s leadership taking action on several fronts. These steps have the potential to influence other city leaders in Brazil, Latin America, and beyond. Rio de Janeiro will host the Summit of Mayors and Cities Congress & Transportation, celebrating the 10th anniversary of EMBARQ Brazil and the city’s 450th anniversary Photo by Kirilos / Flickr. As the chair of C40, Mayor Eduardo Paes is already spreading the gospel. Paes will join other city leaders and experts from EMBARQ—WRI’s sustainable mobility initiative—for a Mayor’s Summit on September 9, 2015, and the International Congress on Cities and Transport conference from September 10-11, 2015 to help spread information about best practices and inspire mayoral leadership across the globe.